I stopped watching after I seen the second Universal Soldier. While I tried not to I was really hyped up to watch this one as I always heard it was a great one. So while I enjoyed it very much... I was kind of expecting more from it. So while it was very enjoyable... at the same time I was kind of thinking... ok... that's it? All THAT hype for this? I don't want you to get the wrong idea here... this is one I definitely want to add to my collection! I hope you do watch it again, Pete. It is a challenging and occasionally cruel film that doesn't attempt to entertain. I've always said you need a couple of runs at it to fully appreciate it. You might just come to love it. First time I saw it, I was definitely underwhelmed. Now, five or six viewings later, the last two very close together, I regard it as Hitchcock's finest and one of the best films ever made. I don't think you've reviewed much Film Noir, Pete, which at least the first part of Vertigo is. Before you see it again, consider Chinatown, Double Indemnity and Laura, which all share themes that Vertigo used. Less obvious, but still part of the same theme, L.A. Confidential and Touch Of Evil. I can see you enjoying any of these, more so than Vertigo. 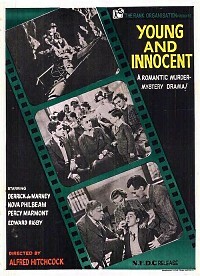 They are far more focused on a regular plot, whereas Hitchcock took off on a tangent halfway through. But after seeing any of those films, you might see what all the fuss is about in Vertigo too. Thanks for the suggestions Jon. I am sure I will be watching it again. Will be looking to get the dvd (whether in a set or by itself) hopefully before too long. Though we have been struggling a little over here so my dvd shopping has taken a backseat. Not getting nearly as many as I used to! This movie is definitely heavier on the violence as well as some suggestive dialog. So it is not one for the kiddies... but I don't think it is to bad... I would say the teens on up would enjoy this movie. One thing I did find a little on the strange side is that you don't hear the name Wonder Woman till the end of the movie. But that is such a minor thing it doesn't matter in the least. I am hoping we see a sequel to this one before too long. As well as the long awaited live-action movie. The one problem I did have with this movie... and is true about all the animated super hero movies I have seen... is the short run time. 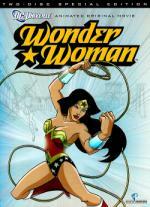 Jimmy... you can skip Wonder Woman in the review links... already have a full one up for it. Time to bust out the wallet again. I've been sticking my fingers in my ears singing "la-la-la" as far as that series is concerned! I'll get to volume 1 one day and then it's all down hill from there. I think I have all of the Fox Film Noirs that are going to be released, even Boomerang! which was withdrawn for some unknown reason. It's worth a fair bit, but a great film. You mean to tell me that you don't own any of that series? Shame, shame, shame on you Jon. Warners and RKO were the best studio's for noir. You must rectify this forthwith. This is a movie I haven't watched in a while. I don't know why I haven't watched this one again till now... it really is a very good movie. I liked it just as much... if not maybe a little more... then the first part. The story more then kept my interest. 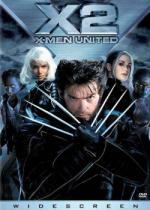 It has lots of fun with the mutants using their powers. I also liked how they go into Wolverine's past a little more in this one. I really enjoyed the entire cast in this. I can't think of a single one that didn't do a good job. A writer accused of murdering his girlfriend escapes police custody with a young woman in tow and the two fugitives attempt to find the real killer to prove the man's innocence. This is another movie I got in the Alfred Hitchcock: The Legend Begins set. This one turned out to be an enjoyable movie as well. It is a nice little murder mystery with a bit of comedy and romance thrown in for good measures. I do think the mystery was solved a little too easily at the end though. While not the best I ever seen... I thought the quality of the DVD was surprisingly good. But that is probably because of two things... how old the movie is and how cheap the set is. So I was expecting very low quality. Watched 2 movies out of this set now... and enjoyed them both. This is turning into a right good purchase. Among the 14 movies I recently watched in my little Hitchcock marathon, it certainly is in the Top 3, but I'm not that enthusiastic about it. I may have missed some subtleties (Reverseshot recently had an entire essay about the use of a car honk during the first scene between Midge and Scotty), but a lot of the times his "visual storytelling" is so painfully obvious, that you can nothing but groan in frustration. Just think of the shots that mimic Scottie's POV as he sees Madeleine sitting before the portrait in the art gallery. Argh. Linda Sterling was known as "The Queen of the Republic Serials" when she starred opposite George Lewis in ZORRO'S BLACK WHIP. This was one of the most strange Zorro films, for the very name was mentioned only in the main title of the picture. 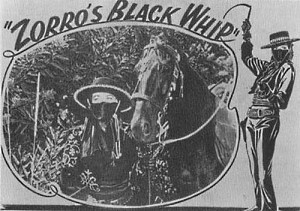 Throughout twelve exciting chapters, Linda was known only as "The Black Whip", who was assumed to be male until the final chapter unmasking scene. George Lewis usually played a heavy, but this time filled the starring slot as a government agent sent to assure an honest vote on Idaho Statehood. Linda's brother, who is the real Black Whip, is murdered by thugs opposing the law and order which would come with Statehood, and Linda picks up his mantle to oppose their evil in full Zorro regalia, in fact if not in name, as ZORRO'S BLACK WHIP! This is the second time I have watched Zorro's Black Whip since I bought the Zorro set. while the title is very misleading... I really enjoyed this one a lot. I especially enjoyed Linda Sterling as The Black Whip. See... this movie is not about Zorro at all. But a female Zorro like character. I think the studio was just cashing in on the Zorro name. Linda Stirling was very good... and very attractive. It is a shame this is the only thing I own with her in it. This serial has some fun and entertaining cliffhangers. And plenty of old time Western style action. I especially liked that this one has a female Zorro like character. I always liked watching a good strong female. For the time this is made I find it pretty incredible. There is also some comic relief in this one also. In the form of Tenpoint Jackson... an old man that works the newspaper for Barbara... he is the only person that knows Barbara is The Black Whip. Well... through most of it anyway. Right there is a key point. I love that style when I watch a Hitchcock film. He manipulates the viewer with such skill... but you have to be complicit in what he's trying to do. So if you don't like it and resist, then yes, it becomes obvious. People often say that his style beget Spielberg's and I certainly see the comparison, and it's why I hold Spielberg in such high regard. Empire have just done a two issue celebration of all things Hitch and they said that both directors put themselves in the audiences seat, which I thought was apt. What were they saying about the car horn? Certainly one of the aspects of such a controlled style, coming from Expressionism I think, is that absolutely everything is contrived. If it's there, it's there for a reason. To me it is crafty, but pedestrian. Look here! Look there! See, now important plot points have been conveyed visually, not by talking. Yawn. Visual storytelling, but with way too much emphasis of the "telling". It lacks elegance, it lacks enigma, but most importantly, as a viewer I feel imprisoned. I'm quite comfortable in my audience seat, but only if I don't have to fight the director for it. Hitchcock's style is functional, to transport exact the amount of information he intended to. The German playwright Heiner Müller once said, paraphrasing Lichtenberg I believe, that the text is smarter than the author. Hitchcock tries very hard to avoid that. There is way too often no associative freedom left for me as the viewer, which makes cases such as the gallery scene painfully boring, because I'm already way ahead of what he wants to tell me. I wonder what you would think of Guerin's "In the City of Sylvia", which pretty much is "Vertigo" boiled down to its essence and freed of the plot - and with a dash of "Rear Window". A little unfair to compare movies from such different eras and with such different approach, but that really is what I would consider visual storytelling. It's about how Hitchcock added the honking of a car horn in the exact moment as Midge looks up to Scottie and how it is the only exterior sound in a carefully edited studio scene, where the actress who played Midge had no clue what that look was about. An expansion of what you already said about Hitchcock's controlled style.